Water Gardening & Fishing: What Great Combination! This year we had a great garden. Some years, the weeds outnumbered the vegetables, but not this year:). 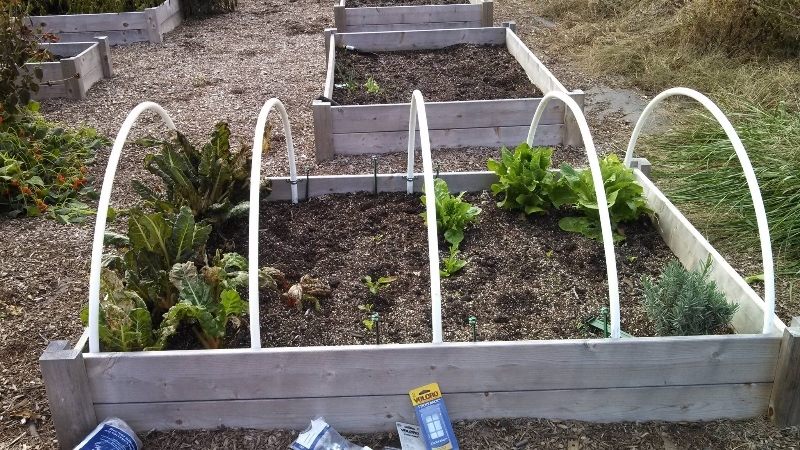 We put together a raised garden loosely following square foot garden principles. We had a bountiful harvest. Knowing that the frost was coming (and now here and gone before this post- sorry), we wanted to extend our garden season. I watched a few youtube videos with this one being my favorite, http://www.youtube.com/watch?v=v6bWeYCV53A. I liked the simplicity of it, but I knew storage of it would be difficult during the summer. So, I improvised a bit. I found everything I needed at the local hardware store running into at least three of you:). Yep, I was the one awkwardly carrying 10 foot sections of pex tubing through the store! 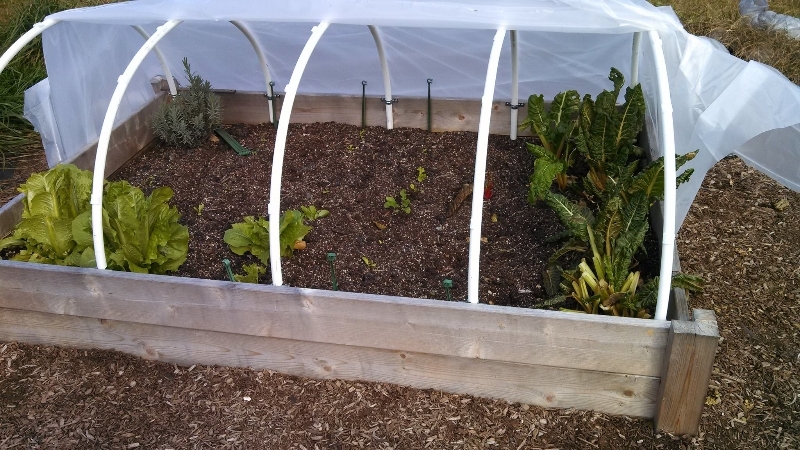 I chose not to hinge or build a bottom frame for the cold frame since I wanted storage to be simple. I ended up using the staple gun to secure the plastic sheeting on the one side and using sticky tape and rocks on the other side for easy access. Project rated easy since it took under an hour to complete and I didn’t need to call in backup. You can see my progress by clicking on the photo. 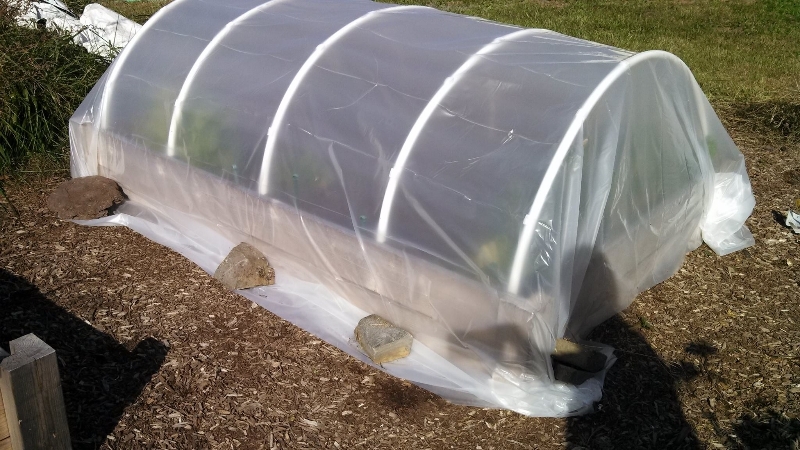 My lettuce are all tucked in for the frosty evenings and we’ll be all set in the spring to get a jump start on vegetables! I am going to backtrack and invest in a vent. Day 1 it was pretty warm in the bed and I would hate to fry my romaine lettuce. What plants do you like to grow in the fall? 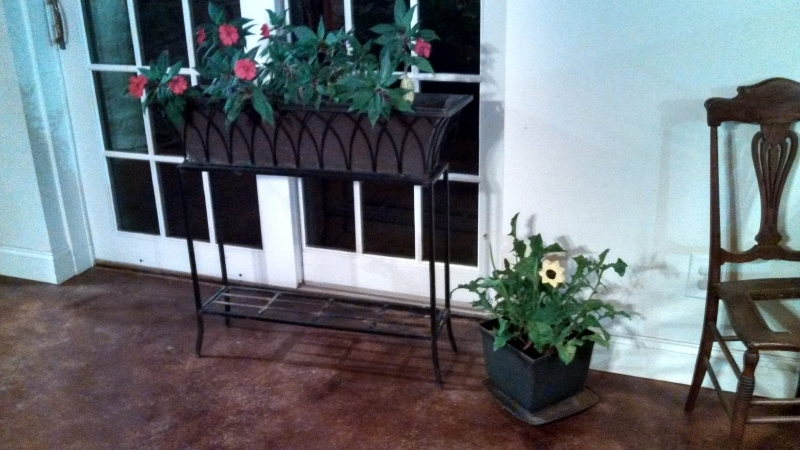 This entry was posted in Plant Care on October 27, 2013 by admin. OK- I may be a day or two late for this post. We all knew that frost was coming, but well I procrastinated. You still have a chance to save those tropical marginals. Over the summer months, we let those beautiful plants filter our ponds by placing them in rocks, which allows them to keep our water clear. Typically, prior to the first frost, we will move those tropicals indoors to keep a bit of the ponds with us all winter long. We replant the pond plant into regular potting soil (You know the kind we would NEVER use in the pond!) in a decorative no hole container. The best places are in sunny location with a weekly dose of water. It does not need to be in standing water. Just keep the soil moist. Here are some of my favorite tropical pond plants to bring indoors: The ChiChi Bluebell plant, umbrella or papyrus plants, and of course don’t forget those hanging baskets and outdoor container plants! 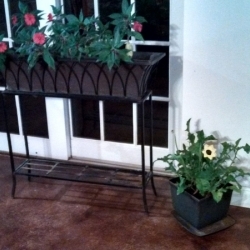 This entry was posted in Plant Care, Pond Care on October 27, 2013 by admin. Not exactly pond related . . .but we did sell tomato plants this spring. Remember those great grafted heirloom tomatoes I may have pointed out to you in the greenhouse? Wow! They are amazing. The growers grafted a heirloom tomato to a good root stock tomato and what does that mean? It means a yummy, very productive, fruit bearing plant! 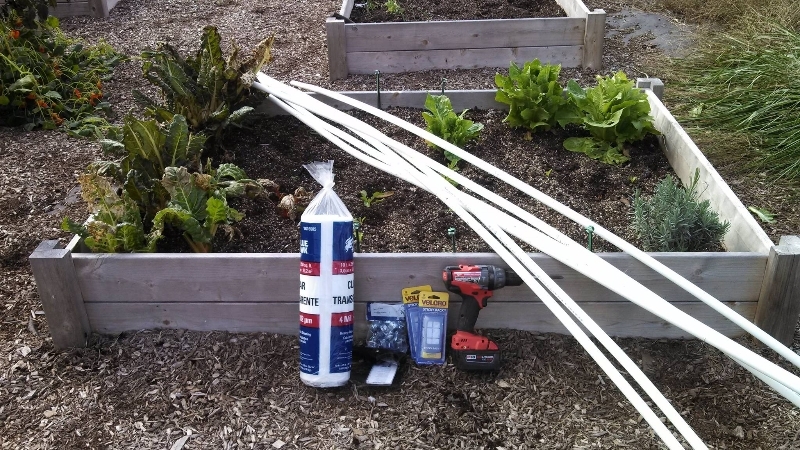 Care should be taken to ensure that the graft remains above the planting line unlike typical tomatoes where you take off the lower branches and plant it in for a better root system. I have been swimming in tomatoes . . .and this is good, very good:). But I am now thinking cold and unfortunately white stuff and that typically means no more garden tomatoes. I was unsure what I wanted to can for winter. Salsa? 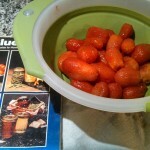 Tomato soup or sauce? So I went whole tomatoes so I can decide later. 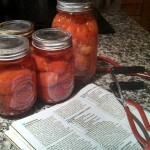 I pulled out that handy dandy Ball canning book and rolled up my sleeves. What are you doing with all of your garden crop? 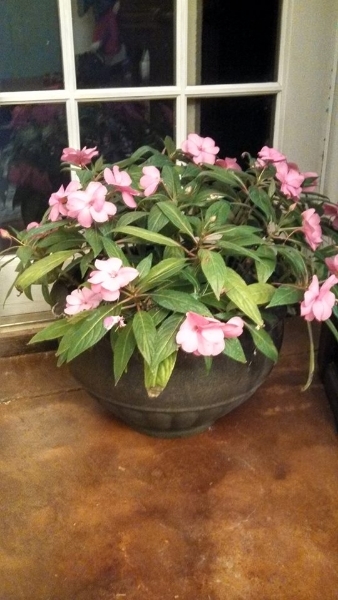 This entry was posted in Plant Care on October 11, 2013 by admin. Hardy Water Lilies & Lotus are easily wintered. 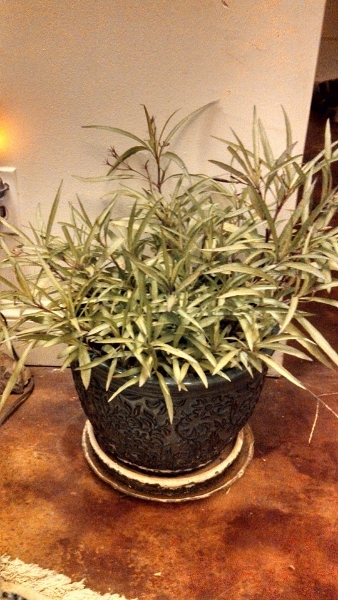 Trim back the yellowing leaves and ensure the lilies are in a depth where their roots will not freeze solid. Remove any dead leaves and stems. Hardy Marginal Plants can survive as long as they stay in the pond. These plants include irises, sweet flag, pickeral rush and horsetails. Prune them back after frost leaving about 2″ the the stem above the water’s surface. The crown of the plant should be underwater. 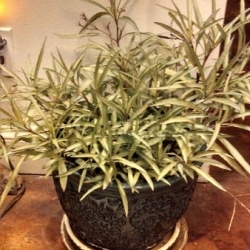 Tropical Marginal Plants cannot survive our cold winters, but most can be easily brought indoors before the first frost. Choose a sunny location and keep the plant well watered. 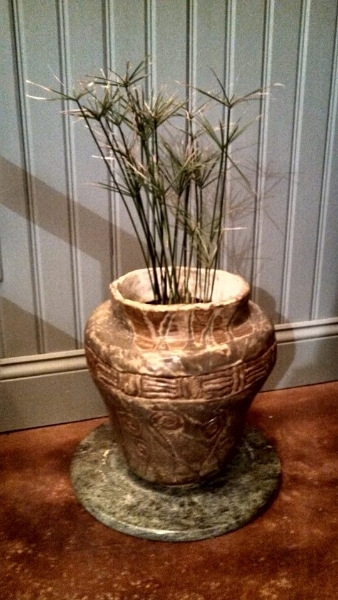 The umbrella palm, papyrus varieties, cannas, blue bells, and taro all do well indoors. We recommend planting them in potting soil in a solid decorative container and water them once weekly while they are indoors. They can be moved outside, typically Mid May, after rinsing the potting soil from their roots and repotting them in pea gravel. Floating Tropical Plants cannot survive our cold winters and are not easily overwintered. Discard these plants after the first frost so they do not become debris on the pond’s bottom. 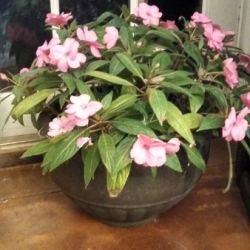 This entry was posted in Plant Care on September 27, 2010 by admin. Spring is here– so where are the plants? The plants are coming! We are expecting some plant arrivals next week, although it is probably safer if you allow us to babysit them until the fear of frost has subsided. Water hyacinths and water lettuce will arrive the end of April to our greenhouse. We again recommend that you wait until mid May to add them to the pond. You are welcome to come visit us and your plants until then:o). 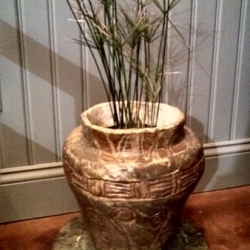 This entry was posted in Plant Care, Pond Store Updates on April 2, 2009 by admin.